We are pleased to announce that we have CUSTOMCORNEA® and that it is now possible for you to have a truly customized laser vision procedure. CUSTOMCORNEA® represents a major breakthrough in laser vision correction and can deliver results even BETTER than conventional laser vision correction. It is the only excimer laser system that allows wavefront diagnostic technology to actually guide an excimer laser during a laser vision correction procedure. CUSTOMCORNEA® uses the LADARWave� Wavefront System to measure distortions in your eye's entire optical system. Until now, conventional laser vision correction, like glasses and contact lenses could only correct the visual distortions called, "lower order aberrations" commonly known as nearsightedness, farsightedness and astigmatisim. It is estimated that these lower order aberrations account fo 85-90% of the overall quality of your vision. Since the mid-1800's eye doctors have measured how well we see using the Snellen Eye Chart. But the Snellen vision test can only measure how much vision you have (quantity) not how much you see (quality). According to the Snellen vision test, your vision is considered "normal" if you can identify the letters on the 20/20 line from a distance of 20 feet. But just being able to identify the letters doesn't necessarily mean you have excellent vision, especially if they are not crisp and clear. Today we know that ther are other imperfections in your eye's optical system that can affect the clarity of your vision and how well you see at night and in low light levels. We call these visual distortions, "higher order aberrations". They can be the cause of glare, shadows, halos and other annoying visual effects. All eyes have some level of higher and lower order aberrations so every patient has the potenial to see better with CUSTOMCORNEA®. CUSTOMCORNEA® addresses the other 10-15% of your eye's optical imperfections that can affect the quality of vision after laser vision correction. The goal of CUSTOMCORNEA® is to decrease the risk of undesirable side effects and improve both the quality of your vision and the quality of your lifestyle. CUSTOMCORNEA® is the process of reshaping your cornea to address both lower and higher order aberrations. 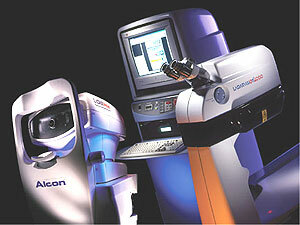 This is accomplished by using the 3-D map of your unique optical imperfections as captured and measured by the LADARWave� Wavefront System to guide the LADARVision� 4000 laser as it reshapes your cornea. Contact our office to discover if CUSTOMCORNEA® can give you the vision that you have always wanted. At the Robbins Laser Site in Rochester, New York, Ladarvision surgeon Dr. Allan Robbins will recommend and provide the laser eye surgery that is right for you. Dr. Robbins recommendations are made after careful consideration of all of the options available for your laser vision correction surgery including CRT, CustomCornea, Ladervision, Laderwave, Lasek, Lasik, PRK, RK, Technolas, VISX or Wavefront. For laser vision correction eye surgery in the Upstate New York area including Rochester, Corning, Elmira and Hornell, NY, Contact Us to schedule your free consultation with Dr. Robbins.This website is not intended for viewing or usage by European Union citizens.